February 18, 2015 by Ecommerce News. About Marketing with tags Europe. 4953 views. 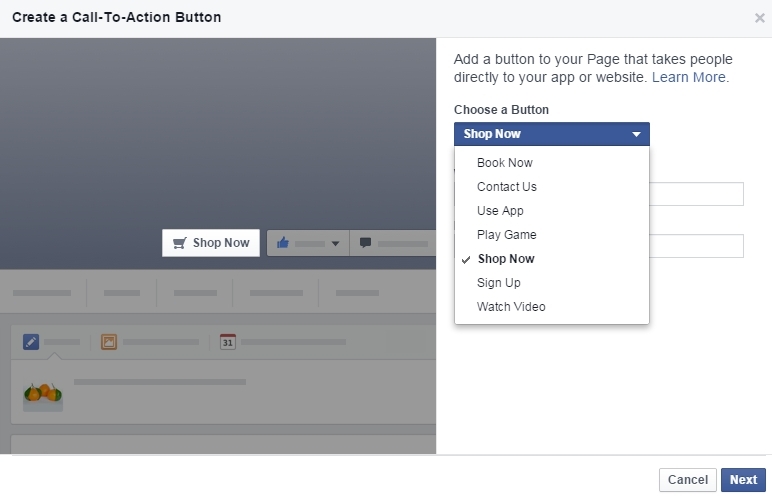 Companies with a Facebook Page are now able to add a call-to-action button, for example “Shop now” with a link to a product, to the top of their page. This feature was introduced in the US at the end of last year, but now it’s also available for companies in Europe. It was already possible to have such a buy button in Facebook advertisements, but with the new call-to-action button at the top of the page, online retailers and other companies can now send their fans to their online store or to a certain product. There’s a group of call-to-action buttons page admins can choose from. The seven options are: Book Now, Contact Us, Use App, Play Game, Shop Now, Sign Up and Watch Video. By choosing for the Shop Now button, page admins can select to which website or web page the button should link to. For example, you can direct your Facebook fans to the homepage of your online store, but you can also lead them to a certain product or product category. It’s impossible to change the name of the button, so it will always say “Shop Now”, accompanied by a shopping cart icon. Facebook introduced the call-to-action buttons on December 11 last year, but back then the features was being rolled out in the US. However, the social network said it would also roll out “worldwide next year”. And now, almost two months later, we’ve seen this feature available in several European countries.